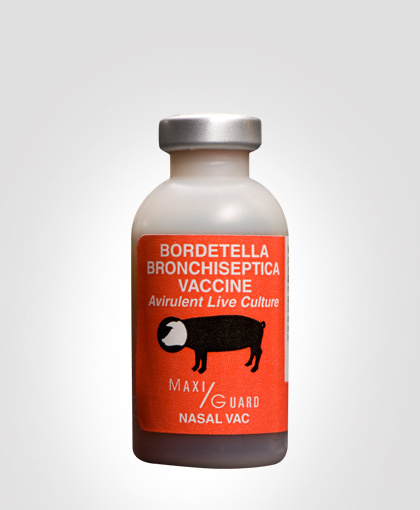 MAXI/GUARD® Nasal Vac® – An avirulent live culture Bordetella bronchiseptica vaccine for the prevention of respiratory disease in baby pigs. 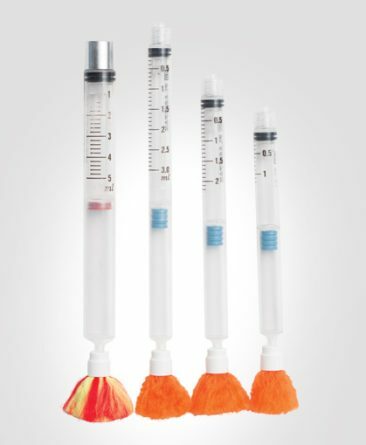 MAXI/GUARD Nasal Vac features include one dose intranasal administration, providing benefits of lower labor intensity, less stress (no needles) and lower costs. Nasal Vac is recognized by both private and corporate swine production facilities as a valuable disease preventative. Dosage – 1/2 ml into each nostril of piglets at one to three days of age. Packaged in 30 dose bottles (nasal tips included). Addison Biological Laboratory, Inc. is a manufacturer of innovative veterinary technologies who sells exclusively through ethical veterinary distributors. 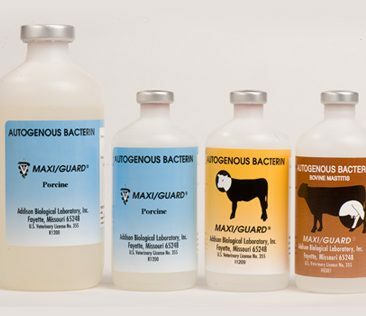 Livestock owners should check with their favorite veterinarian to see if they carry our products. MAXI/GUARD Nasal Vac attaches to the ciliated turbinate epithelium and helps stimulate a secretory IgA response. Nasal Vac occupies Bordetella bronchiseptica (Bb) receptor sites thus effectively blocking attachment of pathogenic Bb. By preventing attachment of pathogenic Bb we help preserve the integrity of the ciliated epithelium. 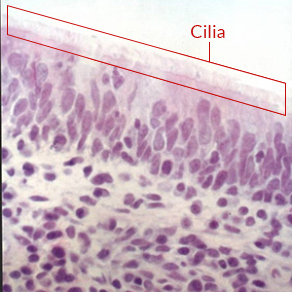 The ciliated respiratory epithelium is the primary filter for the upper respiratory tract. Properly filtered air greatly decreases the pig’s pulmonary challenge from particulate matter and air-born pathogens, such as Pasteurella multocida and Streptococcus suis. The vaccinal strain acts by colonizing vulnerable turbinate surfaces. This organism attaches to cilia near the lumen of the respiratory tree, rather than invading deeper tissues. Attachment is dependent upon protein adhesions produced by the organism. Successful colonization of the piglets ciliated epithelium suggests that there is no maternal interference even if the sow has IgG antibodies to Bordetella, as these antibodies are not secreted into the lumen of the piglets respiratory tract. After 21 days, presence of the competing vaccinal strain is less critical, perhaps due to IgA development. Note the healthy ciliated brush border and the curvature in the cilia illustrating the beating or sweeping action which constantly moves the mucous layer and its trapped bacteria and particles toward the throat where it is swallowed and eliminated. Epithelial damage typical of B. bronchiseptica infection. 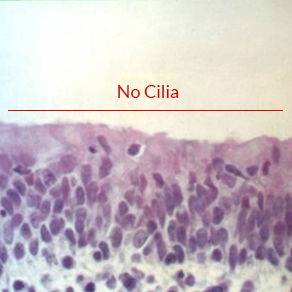 Without the functional ciliated epithelium, the mucous layer is static. Trapped organisms are not eliminated and instead are allowed to reproduce and dramatically increase the challenge to the pig’s system. At some point, the challenge may overwhelm the immune defenses and result in respiratory disease and/or intoxication as with P. multocida. Read our Most Common Questions and Answers on Nasal Vac. MAXI/GUARD Nasal Vac is administered intranasally (0.5ml/nostril) during the first 1-3 days of life where it quickly colonizes the nasal turbinate and respiratory (tracheal, bronchial) ciliated epithelium. Colonization by this organism is important during the first 21 days of life as this is a critical period for damage to the mucociliary apparatus by pathogenic Bordetella. Natural infection by Pasteurella multocida resulting in severe Atrophic Rhinitis increases between 12-16 weeks in unprotected animals. 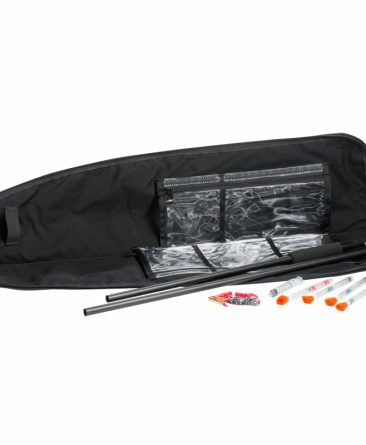 Nasal syringe tips are provided with the vaccine. These enable direct application into the nasal cavity. 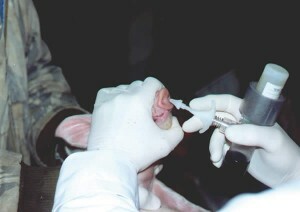 The vaccine is delivered as a liquid stream directly into the nostrils while the piglet is held upright with the head and nose projected upward. One-half ml in each nostril, as close to the first day of life as possible, provides low cost respiratory disease control. See safety. No adverse animal reactions have been observed or reported while administering or implementing this product in porcine herds. For additional technical questions on MAXI/GUARD Nasal Vac, please call 800-331-2530.